Daylife Uncensored springs from my thesis Dimensions of Censorship and further investigates the notion of media censorship. Drawing from Foucault's rejection of the duality of freedom/repression, this work aims to avoid taking the 'either/or' binary approach in this complex and controversial topic. The result is in the form of a digital poster where the printed layer represents the first instance of received information (what is given to you), in this case an article selected from the website Daylife.com, chopped, censored and modified. 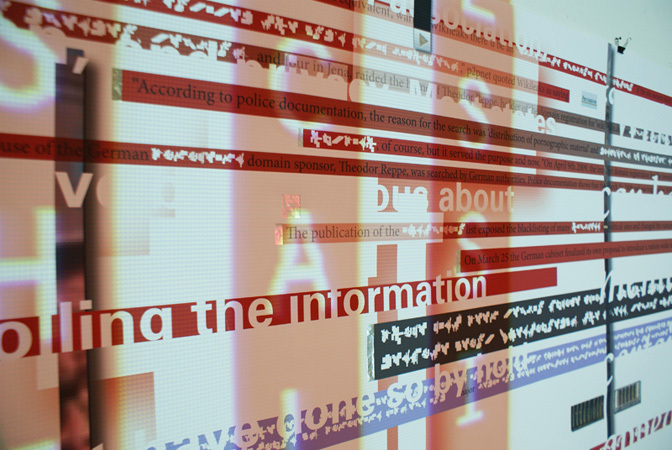 The digital layer comprises of an interactive switch (created with Arduino hardware and Flash software) that when met with a specific point on the poster, triggers video projections, images, sound and text over the printed surface. This layer represents the hidden uncensored material of the original article. The two mediums merge together to answer to each other and the work continues to raise questions beyond the immediate experience of it. A typeface was also designed based with the intention of obscuring meaning. This work was nominated and exhibited at Gogbot Festival, Youngblood Prize Award, Enschede, 2009.